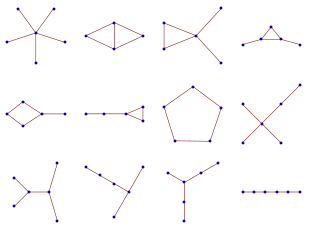 Most study of polyforms assumes that the shapes constituting a polyform are all immutable and identical, and that they connect in a finite number of ways. I find that sets of polyforms without these characteristics can be just as interesting. Unit coin graphs, or penny graphs, are graphs formed by the adjacencies of non-overlapping circles of unit radius. For some graphs, finding a unit coin configuration that realizes the graph can itself be an interesting challenge. In a perfect binary tree with n levels, the area usable for placing coins is proportional to n2, but the area taken up by the coins is proportional to 2n. So there is reason to hope that just before the latter quantity overwhelms the former, finding a configuration without overlaps will make a good puzzle. And here's a solution for n = 6 with rotational symmetry. Considering coin configurations as polyforms, we can think of two unit coin configurations (or polypennies) as being equivalent if we can transform one into the other by a combination of reflection and sliding coins without changing which coins are adjacent. Two configurations with the same graph can still be considered different if it isn't possible to transform one into the other in this manner. The numbers of configurations of n pennies for n between 1 and 5 are: 1, 1, 2, 5, and 13. 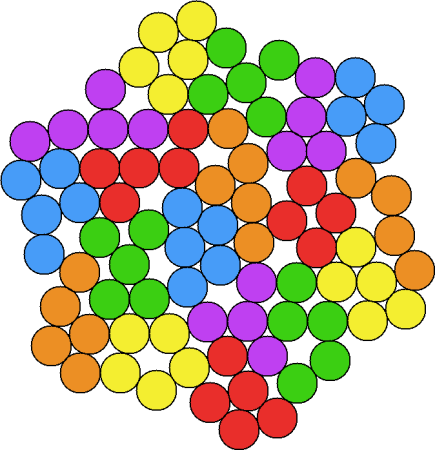 If one penny is placed at the center of the figure to be tiled, another 64 pennies could be placed around it in a figure with 4-fold radial symmetry. Can such a figure be tiled by the pentapennies? Common superform related problems can also be fruitful with these pieces. Here are my best attempts at a minimal common superform and a maximal irreducible common superform for the pentapennies. 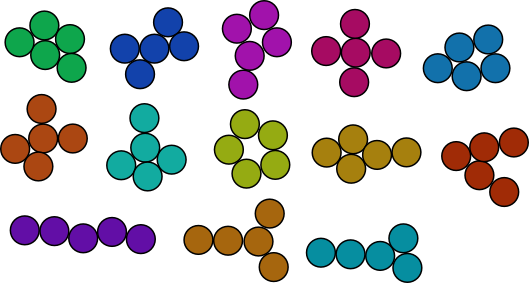 Another type of flexible polyform using circles can be formed by relaxing the requirement that all of the circles be the same size. Two polycircles are equivalent if one can be transformed into the other through some combination of continuously expanding or shrinking the circles, along with the transformations that are allowed with pollypennies. 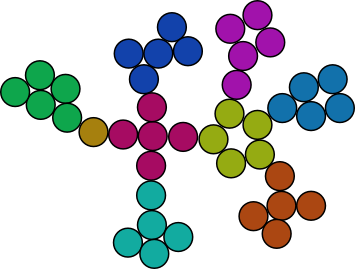 Some polycircles are possible that don't have an equivalent polypenny because small circles can fit into gaps between other circles. There are several polyform variations that use triangles as their base form, including polyiamonds, polypons, and polyaboloes. These are distinguished by the shape of their base triangles. 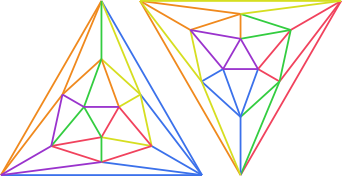 What if we allow the shapes of the triangles to vary? We can then count as equivalent all configurations of triangles that are connected in the same way. 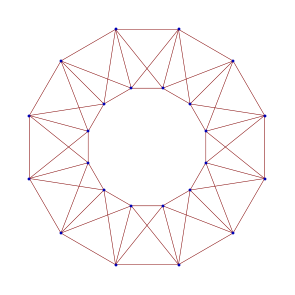 There are 9 hole-free pentatriangles in this scheme. 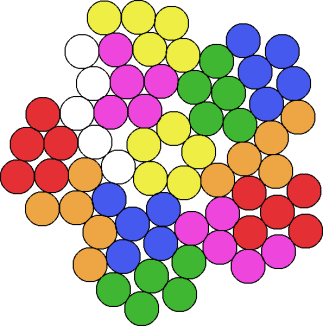 As with the pentapennies, an interesting puzzle using the flexible pentatriangles is using them to tile a configuration with 5-fold radial symmetry. Here's one solution. An open problem is finding all of the configurations like this can they tile, and all of the ways they can do it. The diagram to the right shows a tiling of the nine hinged tetriamonds. The hinges here only allow rotations of cells within the plane. We could instead have hinges that allow cells or groups of cells to flip over. If we did, the brown and violet tetriamonds would represent the same piece, as would the yellow and blue tetriamonds. Since I didn't think I could do much better than to have four symmetries, in this case I chose to use rectangular symmetry rather than radial symmetry as in the previous sections. Below are the 11 hinged tetrominoes. I still haven't found a symmetrical tiling for these. Polysticks are a type of polyform where the individual units are line segments, usually unit segments on a square grid. What would happen if we relaxed the grid requirement, and allowed the units to be any segment at all in the plane? It seems that what we would end up with would be equivalent to the n-edge connected graphs. Ronald Kyrmse considered these forms, which he called polynemas, in 1973, and exchanged correspondence with Martin Gardner on the subject. However, while he enumerated the polynemas of small orders, it doesn't seem as far as I can tell that he considered tiling puzzles using these forms. I prefer the term "polyedges" for these. There are 12 pentaedges. Can we make good tiling problems for them? One problem is that graphs are a lot more flexible than polyominoes, so it might be difficult to keep the number of solutions down to a reasonable number. On the other hand, we can use the flexibility of graphs to our advantage, and pick a highly symmetrical graph to tile, so the number of distinct (i.e. nonisomorphic) solutions is kept down. The first two graphs shown tiled by pentaedges to the right are highly symmetrical indeed. 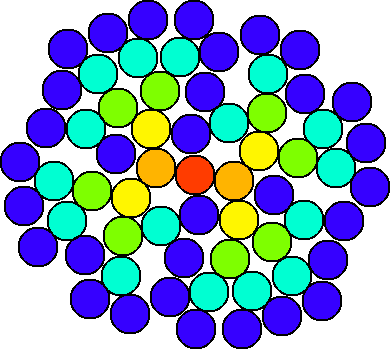 The four copies of K6 have 6,449,725,440,000 symmetries (or automorphisms). The pair of icosahedra have only 28,000 symmetries, but the graph is planar. With polysticks, we often like to forbid solutions from containing points where two polysticks cross. We can do the same with polyedges, if we set up the pattern properly, as was done in the last tiling. Notice the trick I played with the pentagonal (or 5-cycle) pentaedge at the bottom of the figure, putting the 5-star pentaedge inside it. 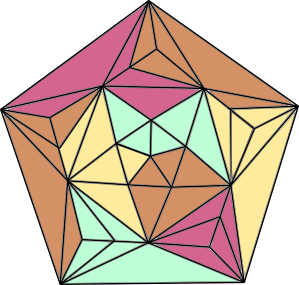 In the previous problem, we couldn't tile the icosahedra without any crossings, because one pentaedge contains a 4-cycle, which can only be placed on an icosahedron with an edge connecting two opposite corners, and the pentaedge containing this edge must cross the 4-cycle. Coloring is an interesting problem with these. We define as adjacent for the purpose of coloring any two pentaedges that share a vertex. 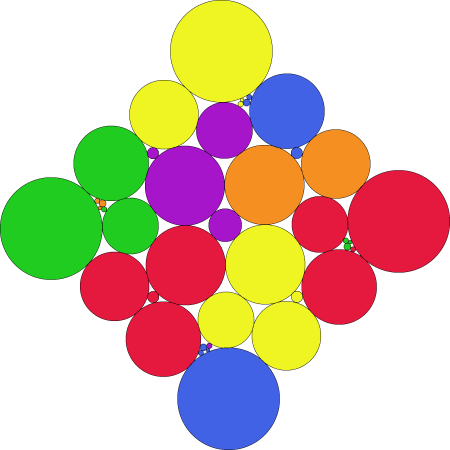 With planar graphs, famously, only four colors are required. Edge coloring is not the same as vertex coloring, however. 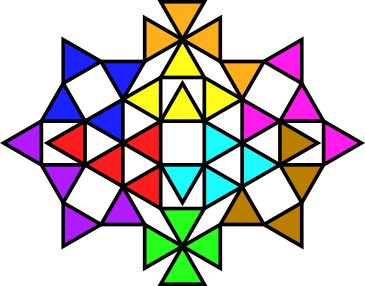 Since more than four edges can meet at a vertex, it is not hard to find tilings that require five colors. The double icosahedron tiling here requires 6 colors. 3 colorings should be harder than we're accustomed to in polyforms, but probably still doable. 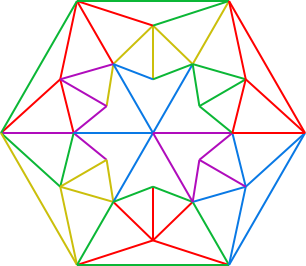 For the double icosahedron, an interesting problem would be finding a 3-colorable tiling.